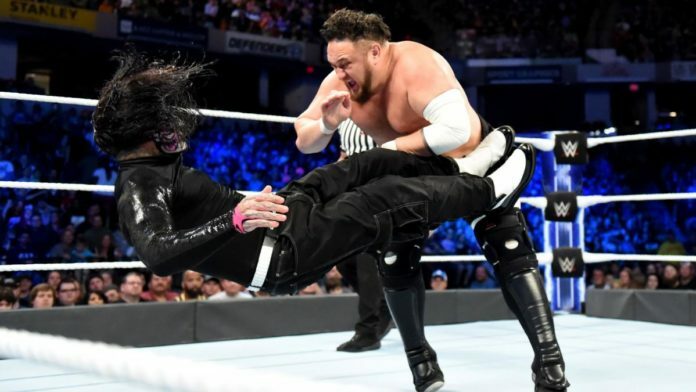 Samoa Joe has defended his verbal assault about Jeff Hardy over the past two weeks of SmackDown Live. It all started once interrupted Hardy’s celebration of being with the WWE for 20 years. During this segment, Joe brought up Hardy’s past issues with substance abuse. As seen on this week’s episode of SmackDown Live in Austin, TX at the Frank Erwin Center on the USA Network, Hardy lost to Randy Orton in a singles match once Joe distracted him by appearing on the big screen while at a bar pouring himself a beer and talking about responsible drinking. Orton won the match with an RKO.